Steep roads, thin air, breathtaking views! When riders from all over the world signed up for the 2017 Mavic Haute Route Rockies, Magnolia Drive and Berthoud Pass would undoubtedly have been two of the most exciting prospects for the week. Getting both on the same day during stage 2 made for a sensational day out on the road. After leaving Boulder on Boulder Canyon Drive under clear blue skies, the peloton meandered its way through the towering trees and deep gorges. As they left the canyon they came face to face with Magnolia Drive, a paved 4.47 mile (7km) ascent averaging a 9.8% grade and culminating at 8,665 feet (2,641m) in the heart of the Roosevelt National Forest. The first quarter-mile (400m) averages 14.75% and was a true test of both physical and mental strength. 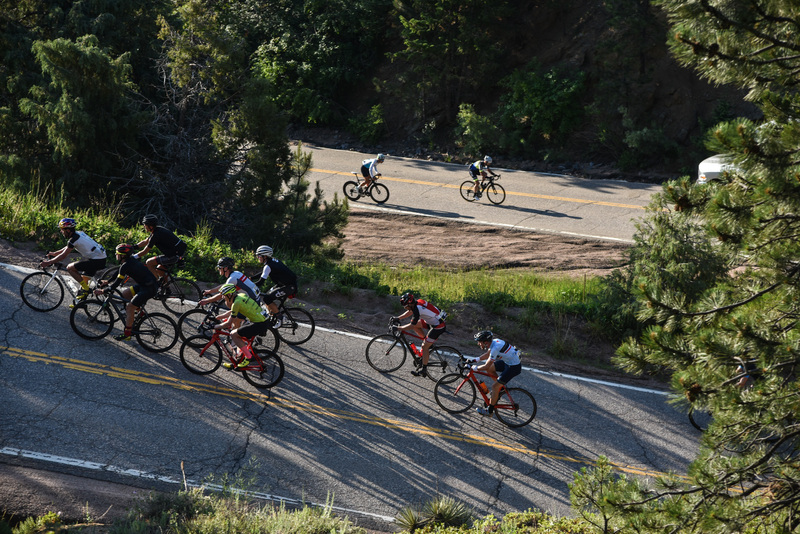 After summiting Magnolia Drive, riders took on rolling hills made up of a mix of gravel and paved roads in order to reach Central City Highway before a more relaxed drop down into Idaho Springs. From here participants started to climb again once they reached the bike path that twists and turns alongside Interstate 70. This continued all the way to the summit of Berthoud Pass; rising approximately 4,000 feet (1,200m) over 27 miles (43km). With the heat of the summer sun beginning to make an impression and altitude affecting their breathing as they neared the summit, the Mavic Haute Route Rockies riders each fought their own silent battle on their way up this giant. There was a fierce competition today at the front of the peloton. Finishing second yesterday, Matthew Davies from Great Britain took the stage win 4 seconds ahead of Matthew Busche, who holds on to his leader’s by a mere 17 seconds. Winning her second stage in row in the women’s rankings, Emma Pooley also finished in an impressive top 10 position on the stage, alongside the best male riders on the day. Tomorrow’s 95 mile (153km) stage from Winter Park to Avon is longer than today, but should be less demanding for the riders as they stay below 3000m and encounter significantly less climbing.